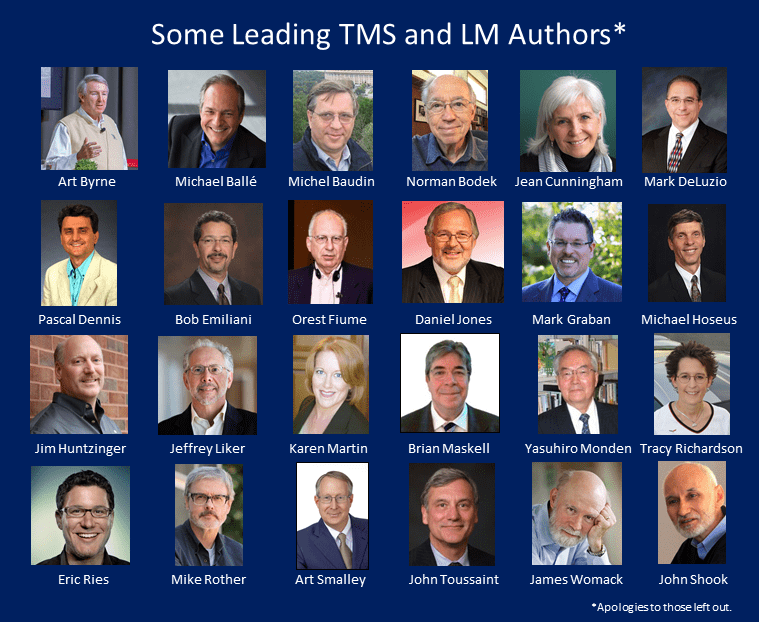 Throughout my work over the last 25 years, I have always sought to better understand Toyota’s management system (TMS) and its derivative, Lean management (LM). From the beginning, the aspect that interested me most was leadership. Specifically, what leaders (CEOs, presidents) do or don’t do to advance the practice of management, and why. My ideas on this are contained throughout my writings (click here to view a listing of my academic research papers and here for my books). Lean was introduced to the public thirty years ago as “lean production,” and became known as “Lean management” 11 years ago (in 2007). 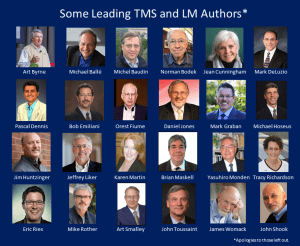 Despite all the good work by the creators of Lean and the many people (Ohno disciples) promoting TMS and LM through conferences, speaking, training, writing, and other means (see image), it was clear that the problem of why efforts to transform large organizations fall short or fail had not been solved. And the solution seemed so far out of reach that even some leading Lean proponents were seemingly on the verge of giving up. Importantly, this problem is not limited to large organizations. The leaders of medium and small organizations also struggle to understand and successfully adopt TMS or LM. While many people have supplied quick answers, they have always been of a general nature and lacked the specific supporting rationale. These answers have been discussed and debated for decades, but no real progress has been made in understanding the problem more deeply so that solutions could be developed and tested. In 2016, I decided to study the problem of why efforts to transform large organizations fall short or fail even more deeply than I had in the past, to understand it better and perhaps identify new ideas and potential solutions. Based on work I did in 2011, I knew the true source of the problem was related to two branches of the social sciences: economics and political science. Instead of relying on contemporary works, I went back in time and read numerous social science books and papers from the late 19th and early 20th century to look for clues. That was around the time Scientific Management (later known as industrial engineering, the forerunner to TMS and LM) emerged, and which also ran into the same problem that TMS and LM have. Going back in time proved to be a fruitful activity that filled in numerous details and answered many questions. The result was a series of four research papers that: 1) reveal fundamental errors in understanding made from the start of Lean (and Scientific Management before that), 2) significantly advances the understanding of why efforts to transform large organizations (and medium and small ones as well) fall short or fail completely — since the inception of progressive management over 100 years ago, and 3) identify potential solutions for people to experiment with. The research papers have been collected into a new book: The Triumph of Classical Management Over Lean Management: How Tradition Prevails and What to Do About It. The research findings can be simply stated as follows: Lean must be led by an organization’s top leaders. However, there exist numerous social and economic rules that disallow leaders from leading (or learning) Lean (Chapter 1). This results in a contradiction whose resolution is impossible under typical conditions, but which can advance to improbable under atypical conditions (which are identified in Chapters 2 and 3). Thus, the Lean transformation problem has now been either been fully solved, or is very close to finally being solved. In addition, the book explains the general case of why management improvement efforts, such as TQM, Six Sigma, Lean Six Sigma, and Agile, also struggle and often fail. Therefore, the book provides important insights across a range of corporate transformation efforts. The book is also useful for educating current and future leaders; to teach them how to break free of the past so that business and society can move forward. Hi Ken – Thank you for sharing.